The archaeological ruins of Tula (known as Tula de Hidalgo or Tula de Allende) are located in the southwestern part of the Mexican state of Hildalgo about 70 kilometers (45 miles) northwest of Mexico City. The site is located within the alluvial bottoms and adjacent uplands of the Tula and Rosas Rivers, and it lies partially buried beneath the modern town of Tula de Allende. Based on extensive ethnohistorical research by Wigberto Jimenez-Moreno and archaeological investigations by Jorge Acosta, Tula is considered the likely candidate for Tollan, the legendary capital of the Toltec Empire between the 10th and 12th centuries AD. In addition, Tula's construction bridges the Classic and Postclassic periods in Mesoamerica, during the period when the power of Teotihuacan and the southern Maya lowlands were fading, to be replaced by political alliances, trade routes and art styles at Tula, and at Xochicalco, Cacaxtla, Cholula and Chichén Itzá. Tollan/Tula was established during the Epiclassic period, about 750 AD as a fairly small town (ca 3-5 square kilometers or 1.2-1.5 square miles), as the Teotihuacan empire was crumbling. During the height of Tula's power, between AD 900 and 1100, the city included an area of some 13 sq km (5 sq mi), with an estimated population perhaps as high as 60,000. Tula's architecture was set in a large diversity of environments, from a reedy marsh to adjacent hills and slopes; within this varied landscape are hundreds of mounds and terraces, representing residential structures in a planned city scape, with alleys, passageways and paved streets. The heart of Tula was its civic-ceremonial district, called the Sacred Precinct, a large open quadrangular plaza surrounded by two L-shaped buildings, as well as Pyramid C, Pyramid B and the Quemado Palace. The Quemado Palace has three large rooms, sculpted benches, columns and pilasters. Tula is justly famed for its art, including two interesting friezes worth discussing in detail: the Coatepantli Frieze and the Vestibule Frieze. 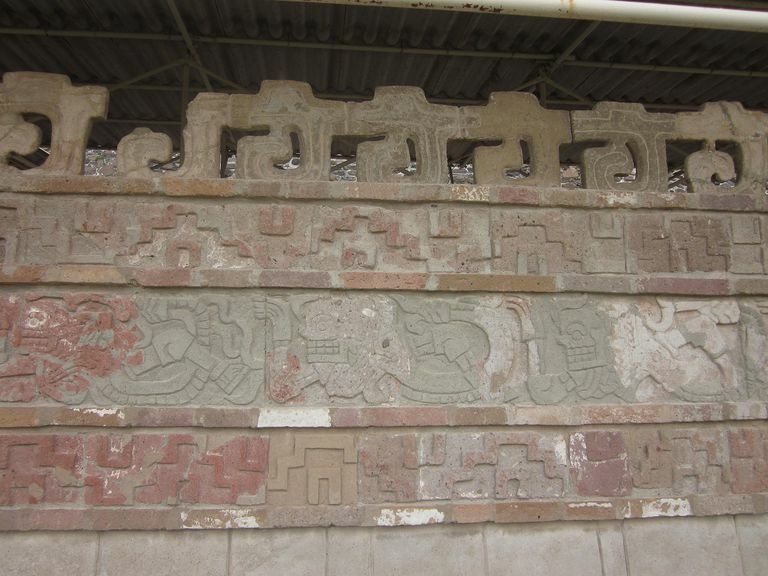 The Coatepantli Frieze (Mural of the Serpents) is the best known piece of art work at Tula, believed to date to the early Postclassic period. It is a carved into a 2.2 meter (7.5 foot) high free-standing wall running for 40 m (130 ft) along the north side of Pyramid B. The wall seems to channel and restrict pedestrian traffic on the north side, creating a narrow enclosed passageway. It was named coatepantli, which is the Aztec (Nahuatl) word for serpent, by excavator Jorge Acosta. The Coateplantli Friese was made from slabs of local sedimentary stone carved in relief and brightly painted. Some of the slabs were borrowed from other monuments. The frieze is capped by a row of spiral-shaped merlons; and its facade shows several reclining human skeletons intertwined with serpents. Some scholars have interpreted this as a representation of the feathered serpent in pan-Mesoamerican mythology, called Quetzalcoatl; others point to the Classic Maya Vision Serpent. (see Jordan for some interesting discussion). The Vestibule Frieze, while lesser known than that of the Coateplantli, is no lest interesting. It is a carved, stuccoed and brightly painted frieze that illustrates a line of ornately dressed men walking in a procession, located on the interior walls of Vestibule 1. Vestibule 1 itself is an L-shaped colonnaded hall that links Pyramid B with the main plaza. The hallway had a sunken patio and two hearths, and 48 square pillars supported a roof. The frieze is on a nearly square bench, measuring 94 centimeters (37 inches) high by 108 cm (42 in) wide in the northwest corner of Vestibule 1. The frieze itself is 50 cm x 8.2 m (19.7 in x 27 ft). The 19 men shown in the frieze have been interpreted at various times as local chiefs (caciques), priests or warriors, but based on the architectural setting, composition, costumes and color, these figures represent merchants, people who were engaged in long-distance trade. Sixteen of the 19 figures carry staffs, one appears to wear a backpack, and one carries a fan, all elements associated with travelers (see Kristan-Graham for more). 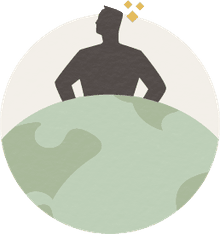 This article is a part of the About.com guide to the Toltec Civilization, and the Dictionary of Archaeology. Castillo Bernal S. 2015. El Anciano Alado del Edificio K de Tula, Hidalgo. Latin American Antiquity 26(1):49-63. Healan DM, Kerley JM, and Bey GJ. 1983. Excavation and Preliminary Analysis of an Obsidian Workshop in Tula, Hidalgo, Mexico. Journal of Field Archaeology 10(2):127-145. Jordan K. 2013. Serpents, skeletons, and ancestors? : the Tula Coatepantli revisited. Ancient Mesoamerica 24(02):243-274. Kristan-Graham C. 1993. The Business of Narrative at Tula: An Analysis of the Vestibule Frieze, Trade, and Ritual. Latin American Antiquity 4(1):3-21. Stocker T, Jackson B, and Riffell H. 1986. Wheeled figurines from Tula, Hidalgo, Mexico. Mexicon 8(4):69-73. Stocker TL, and Spence MW. 1973. Trilobal Eccentrics at Teotihuacan and Tula. American Antiquity 38(2):195-199.